Thanks to an email from CT, I am back. BTW, I’m sure the Russians were the ones that hacked RO (~grin~). It was the Klinton Klan. 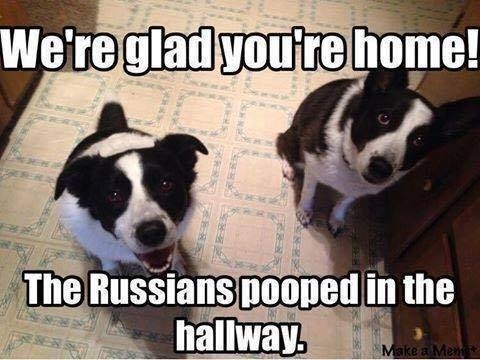 But, they blamed it on the Russians and then they claimed the Russians used it to help Trump win. LOL!! CT; you could have pm’d me or Emailed me. I was lonely (except for Sally) and no one to exalt with. I know what you mean! When I couldn’t get on RO on election night and the days afterward, I was going through a meltdown wanting to scream and shout about the election outcome. Since I am the only conservative in my family I felt like I was going to explode if I couldn’t share my ecstasy! So glad it’s back! To be specific I believe I was banned from CF by saying I was “starting to warm up to Trump” or words to that effect. They said the site was only for “total conservatives.” That’s a problem since I am a liberal Democrat. Ah-h-h-h … You remembered me!!! I know. I was there for awhile. It was a crappy forum, too. I mean the structure of it. Plus, it seemed like they only wanted people who believed the same as they did. That’s when I was told about Political Forum. I think it’s a great forum and it has the same structure as RO. But, PF has a lot of EXTREME people. Lots of JW, Anti-Semites, and whacky liberals. So, there is only so much one can do there without getting totally jumped on by one group or another. But, I still use it because there are a lot of really great people over there. I know. I was there for awhile. It was a crappy forum, too. I mean the structure of it. Plus, it seemed like they only wanted people who believed the same as they did. That’s when I was told about Political Forum. I think it’s a great forum and it has the same structure as RO. But, PF has a lot of EXTREME people. Lots of JW, Anti-Semites, and whacky liberals. So, there is only so much one can do there without getting totally jumped on by one group or another. ** But, I still use it because there are a lot of really great people over there**. Well, hello, everyone. I missed a whole bunch of you! I even missed our lefties. Interesting! I had found a forum called Political Forum and made a couple of posts but was not overly thrilled with the group. For me it went Code 404 just a couple of days before RO showed up as being back. Just checked the PF that I had located is still showing the Code 404. There are two forums at play here, PoliticalForum.com - Forum for US and Intl Politics and The Politics Forums. Which is it? I tried the Politics Forum. Didn’t like the layout or the membership that much. Hi, ho everybody! Just got a notification from FC’s post in the random thought thread!Guess I’m still subscribed to that one Anyways, good to see everybody. I checked the two offered suggestions and found that the first of the two had the same logo header and my screen name and the password I used at PF did work so that must be the one. There is a notice there that reads “PF has switched to Xenforo” but the old URL still has the 404 notice with no forwarding addy. Oh well, who cares? The one I was at was “Politics Forum”. It was ok, except lots of controversial people.